Employment subsidies have been widely used in OECD countries to counteract the recent job crisis, but their effectiveness is difficult to assess. This column summarises the findings of a recent study analysing a 2012 Spanish employment subsidy given to firms with fewer than 50 employees that make use of a new type of permanent contract. Consistent with other country studies, it fails to find robust evidence for increased employment growth due to the subsidy scheme. Following the financial crisis, unemployment increased across large parts of Europe, reaching all-time highs in some countries. As a result, many European governments embarked on ambitious labour market reforms to spur employment growth. Recent evidence points to the beneficial effects from a multitude of reform initiatives, including measures to increase wage flexibility, limit unemployment benefits, and reduce labour tax wedges (IMF 2016, Guriev et al. 2016). Employment subsidies, including hiring subsidies, have been part of the reform package in several OECD countries (OECD 2009). While hiring subsidies are not a novelty, analysing their effects can be a daunting exercise as an evident control group or counterfactual is not always easily identifiable. The few existing empirical studies either do not find an impact on employment level (Hujer et al. 2001, Huttunen et al. 2013)1 or find a short-lasting increase in the employability of an individual.2 In the case of Spain, the OECD (2013) in its early assessment of the Spanish labour market reform suggests that “the comprehensive nature of the 2012 reform makes its evaluation a difficult task [and] the inclusion of a large number of provisions, sometimes explicitly targeted at different groups, does not allow the identification of a suitable control group”. In a recent study, we instead make use of this specific differential treatment of firm groups (based on their size) to identify the impact of the employment subsidy scheme that was introduced in Spain (Gamberoni et al. 2016). The employment subsidy was not the only reform with specific reference to firm size. Various provisions apply to firms below 10, 25, and 50, and above 100 employees – implying more favourable treatment in terms of incentives, flexibility, and severance cost as firm size declines (Table 1). Relative to the pre-2012 reform conditions, only firms between 50 and 100 employees face comparable labour regulations with no specific regulation that is peculiar to them, while firms with between 25-50 employees differ from them only due to the employment subsidy. This constrains the set of considerable treated firms to the range of 25-50, and the control firms to the (symmetric) window of 50-75 employees. The arbitrary size limit of firm eligibility for the hiring subsidy scheme provides for a natural candidate to analyse the behaviour of firms drawing on recent advances in regression discontinuity design,4 comparing treated firms on the left to control firms on the right of the 50-employees threshold. Based on this approach and drawing on the Amadeus firm-level dataset for Spain, we find that in the year after the implementation of the reform employment growth of eligible firms has been about 2% higher than employment growth of firms above the threshold, which could not benefit from the subsidy. Irrespective of the robustness method used, estimated effects of the subsidy on employment growth decline to a level well below the initial estimate, and are now statistically insignificant. Figure 1 illustrates this by comparing employment growth in 2013 for firms with employee size of 25-49 (left quadrant) to those with 50-75 employees (right quadrant). Based on the full sample, a polynomial trend suggests that at the threshold employment growth for smaller firms is significantly higher than for larger firms (black solid line). 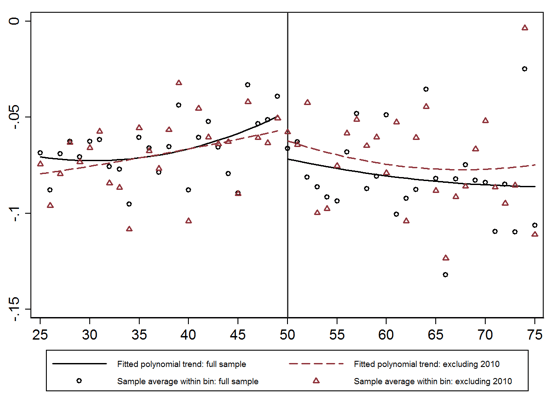 Once firms that are completely unaffected by the 2010 reform are excluded from the dataset,7 the polynomial trend shows no noticeable difference for average employment growth to the left and right of the 50 employees threshold (red dotted line) as employment growth for firms with more than 50 employees is corrected upwards. A very similar picture emerges when excluding firms from the estimation sample with an observed employment pattern that would be consistent with sorting to benefit from the employment subsidy. Analysing the effect of recent labour market reforms in Europe is a daunting task given the lack of an evident control group or a suitable counterfactual. Using impact evaluation techniques, we fail to find robust evidence of an effect on the overall employment growth of eligible firms as a result of the Spanish hiring subsidy scheme implemented in 2012. While the lack of available firm data on actual take up rates of the hiring scheme makes a definite conclusion impossible, the empirical evidence is consistent with firms sorting below the threshold to take advantage of the fiscal incentives and/or avoid stricter reporting requirements as a result of a reform implemented in 2010. Based on the lack of support for an employment-enhancing effect of the subsidy and amidst the associated fiscal costs, caution may be warranted in considering the application and design of similar (size-contingent) hiring subsidy schemes. As more post-reform data become available, it would be important for future research to assess possible long-term effects of the subsidy, including the effect on job security and productivity gains through the use of the new permanent contract. Authors’ note: The views expressed in this column are those of the authors and should not be attributed to the ECB or the Eurosystem. Galasso, E, M Ravallion, and A Salvia (2001), “Assisting the transition from workfare to work: Argentina’s Proempleo experiment”, Development Research Group, World Bank. Hujer et al. (2001) estimate a conditional difference-in-differences (DID) regression using West-German firm-level data. They find no effect of existing wage subsidies on the employment level, citing as a main reason possible substitution from non-subsidised to subsidised employment. Huttunen et al. (2013)’s assessment of the low-wage subsidy in Finland also comes to the conclusion that there has been no effect on the employment rate of the eligible groups, which is identified using a DID approach based on the eligibility criteria for the relevant workers. Groh et al. (2012) for example analyse the impact of training and wage subsidies programmes on female young employees in Jordan based on a randomised experiment, in which a group of participants was randomly assigned a job voucher to reduce employer costs. The authors find that the job voucher led to a large increase in employment in the short-run. However, the impact is no longer statistically significant four months after the voucher period has ended. Galasso et al. (2001) come to a similar conclusion in their study on the effectiveness of a job voucher and training programme in Argentina (Proempleo). Firms cannot have engaged in collective or unfair dismissals in the six months prior to the starting date defined in the new contract in order to be eligible. For hiring workers below 30 years of age, tax deductions of up to EUR 3000 are provided after the completion of the probation period. Firms are also granted tax deduction of 50% of the unemployment benefits that an unemployed person would receive at the moment she is hired with the new permanent contract. Recruiting firms are also entitled to additional fiscal incentives in the form of further social contribution reductions: EUR 1000, 1100 and 1200 per year in the first, second, and third year respectively for each young unemployed recruited (between 16 and 30 years old), and EUR 1300 per year for each long-term unemployed over 45 years old over 3 years. The contract entails an extended probation period of one year (with the possibility to end the contract at will during that time). The applied method, based on local randomisation inference, resembles traditional randomised experiments around the threshold (Cattaneo et al. 2015). Units to the left and right of the threshold must be comparable in terms of their covariates and should have not strategically sorted in order to benefit from the treatment, for the estimation approach to be valid. The design of the subsidy and its speedy implementation are consistent with both these requirements. Thus, by choosing firms in the close vicinity of the threshold, we can assume that all the other factors are ‘evolving smoothly’ with respect to the assignment variable, the level of employment prior to the introduction of the reform (Lee and Lemieux 2010). Therefore, the average treatment effect can be estimated by the difference in the conditional expectation of the outcome variable for units, which are arbitrarily close to the threshold. Sorting just below the threshold in 2011 (or 2012) in order to become eligible for the new contract is possible by not prolonging temporary contracts, as this option is not preventing firms from applying for the new subsidy in the following period. On average about 30% of the workforce is employed via such temporary contracts and their average duration is about 60 days. Placebo tests (pretending the reform has taken place in earlier years) support this hypothesis. Results indicate that there is no difference in employment growth for firms just below and above the 50 employees’ threshold in the years 2008, 2009 and 2010. However, employment growth for firms just below 50 employees compared to those just above 50 employees is significantly higher in 2011 – the year before the employment subsidy was introduced and the year after the 2010 reform was implemented. ← What Do Netflix, Google And Planetary Systems Have In Common?